Crystallins are thought to play a cytoprotective role in conditions of cellular stress. The aim of this study was to determine the effects of crystallin-β-b2 (cryβ-b2) and crystallin-β-b3 (cryβ-b3) on ARPE-19 cells in vitro and on the retinal pigment epithelium (RPE) in vivo. The influence of cryβ-b2 and cryβ-b3 on the viability, proliferation and dying of ARPE-19 was measured by a 3-(4,5-dimethylthiazol-2-yl)-2,5-diphenyl tetrazolium assay, bromo-2-deoxyuridine assay and life/death assay. The expressions of cryβ-b2, cryβ-b3, glial-derived neurotrophic factor (GDNF), and galectin-3 (Gal-3) in ARPE-19 cells were evaluated using immunohistochemistry (IHC), Western blotting (WB) and real-time-quantitative-PCR (qRT-PCR). To evaluate the response of cryβ-b2 and cryβ-b3 to stressed ARPE-19 cells, the cells were exposed to UV-light. 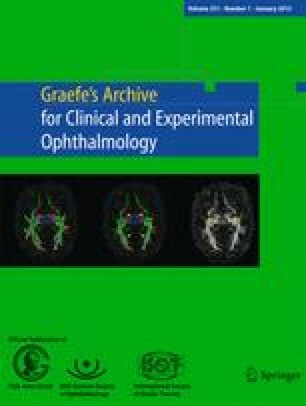 In a rat model, cryβ-b2-expressing neural progenitor cells (cryβ-b2-NPCs) were injected intravitreally after retinal stress induced by optic nerve axotomy to examine whether they influence the RPE. Protein expression was examined 2 and 4 weeks postsurgery using IHC and WB. Detectable alterations of GDNF, and Gal-3 were found in ARPE-19 cells upon exposure to UV light. Adding the crystallins to the medium promoted proliferation and increased viability of ARPE-19 cells in vitro. The obtained data support the view that these crystallins possess epithelioprotective properties. Likewise, in vivo, intravitreally injected cryβ-b2 and transplanted cryβ-b2-NPCs protected RPE from indirectly induced stress. The data suggest that the RPE response to retinal ganglion cell denegeration is mediated via crystallins, which may thus be used therapeutically. The authors thank M. Wissing and M. Langkamp-Flock for their skillful technical assistance, and M. Reis for typing the manuscript. The work was supported by a DFG grant to S.T. (Th 386/18) and by IZKF grants to M.R.R.B. and S.T. The authors thank English Science Editing (ESE) for native linguistic editing of the manuscript.